Expert Sleepers has just released Augustus Loop v2.0 which is a major update to the tape echo/looping plug-in. - Augustus Loop's GUI is now fully skinnable and scriptable. - MIDI behaviour is now scriptable. - VST version now receives MIDI. - Added Record Offset feature. - The 'Max Delay Time' parameter now has a smaller minimum value (1.0 seconds) and is not rounded to the nearest 10 seconds. - Added Tape Read Mode parameter. - The Freeze Loop function is much improved. - A small crossfade is now applied when activating Clear Loop, and when Clear Loop ends. - The Input Level parameter is now protected against sudden changes, which previously could result in audio artefacts. In particular this makes the Punch In/Out features more usable. - A small crossfade is now applied when activating Tap Record. - Added a new mode for the Freeze Loop function, "Freeze Current". - Added 'Sync Group' feature. - Added new 'Tape Sim' section. - Fixed a bug that could cause Digital Mode to not engage correctly. 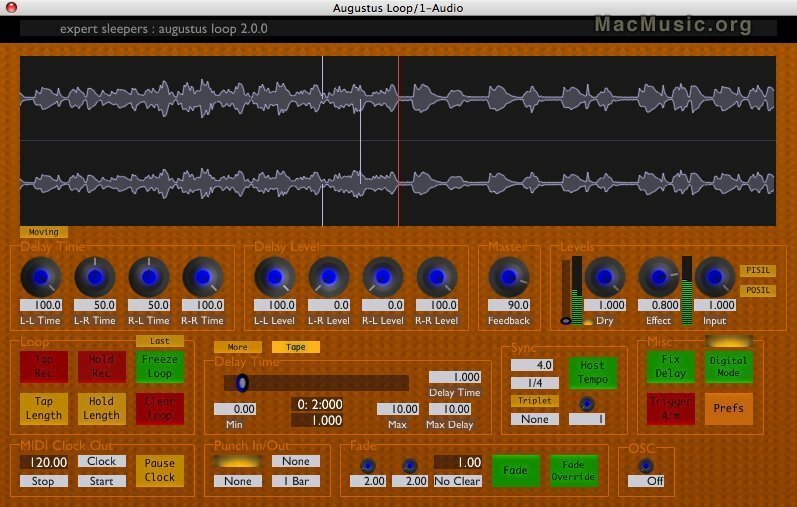 Augustus Loop v2.0 is available now for Mac (AU/VST) and PC (VST). It costs $49 and a registration allows you to install the plug-in on up to three computers at once. v2.0 is a $20 upgrade from v1.5 or higher; it is a $29 upgrade from previous versions.